The high level West Seattle Bridge stands 140 ft above the Duwamish River at Elliott Bay in Seattle. It is a cast-in-place, segmentally constructed, prestressed concrete bridge. This means the bridge was built as two balanced cantilevers, with the formwork being pushed out from each end, until it met in the middle. The superstructure is two box girders and the substructure is two column bents. 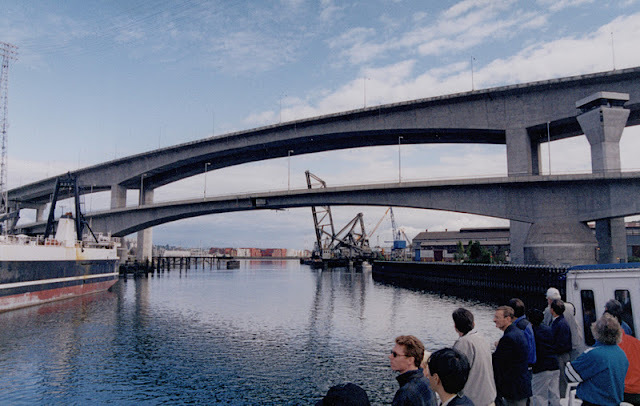 It was completed in 1984, after a freighter rammed into the previous bascule bridge at this site. The low-level West Seattle Swing Bridge, constructed at about the same time, is immediately north of the bridge and carries Spokane Street traffic over the Bay. These two bridges, one wide and high and the other swinging out the way, provide plenty of room for ships moving in and out of the Duwamish River. Washington State Bridges: West Seattle Bridges by Mark Yashinsky is licensed under a Creative Commons Attribution 3.0 United States License.